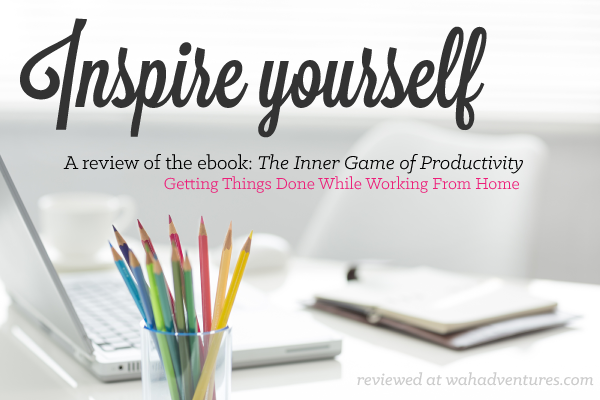 I recently downloaded and read the book The Inner Game of Productivity: The Ultimate Guide To Overcoming Procrastination And Getting Things Done While Working From Home by Chaiwat Theerasong when it was offered for free on Amazon. It caught my eye because it was specifically meant for people who work from home, so I thought it could be beneficial for me, as well as others. This post will provide a short review of the subjects covered in the book, as well as the ways that I’ve applied them to the work that I do from home. Chaiwat starts by talking about the three main reasons why we procrastinate – lack of confidence, mental issues, and lack of energy – and also breaks those down further – for example, when talking about lack of confidence, he says that the reasons why our confidence could be diminished is because we attach our self-worth to our ability and performance, and he also talks about four fears that govern our actions – the fear of failure, the fear of not making the project perfect, the fear of difficulty and being overwhelmed, and the fear of not finishing. Chaiwat then goes on to talk about techniques that will help increase productivity – the first of these is the “unschedule” technique. With the unschedule technique, you schedule your non-work tasks first – this includes any appointments that aren’t related to work, time for sleeping, meals, and recreational activities. You then find ways to use the time that you have left more productively. There are some rules associated with this technique – you can’t work more than 20 hours per week, nor can you work more than 5 hours in a day, and you need to take at least one day off per week. You also need to exercise or “play” at least one hour per day. Also, you don’t record your work time in your schedule; instead you record the amount of time you spent working only after you complete a project – this way, you’ll be able to see how much time you’re spending on a project and make changes as needed. Other techniques that he suggests are tracking the amount time you spend on projects, color-coding your projects, and using a reward system for finishing different tasks – for example you might give your self small rewards, such as a short break to drink a cup of coffee, when you finish a certain part of a project, and a larger reward when you finish the entire project. Another technique that Chaiwat suggests to get yourself motivated is to create a vision board – a vision board is a big board that you attach pictures to that inspire and motivate you to achieve your goals. For example, they could be pictures that represent goals you want to achieve, such as buying a house or paying off a major debt. Once you’ve made the board, put it some place where you’ll see it often, and it will keep you motivated to achieve your goals. If you don’t want to create an actual board, there are other ways you can create a vision board on your computer -instead of creating an actual board, I created a slide show in Powerpoint that had pictures of things that were related to goals I wanted to accomplish. Another way that you could create a vision board that could potentially be shared with others is to create a Pinterest board if you have an account on Pinterest – you could put pictures that relate to goals you want to accomplish on this board. If you wanted to, you could then share this board, or you could keep the board private if you don’t want others to see it. Other topics that Chaiwat talks about are how to get started on a project, how procrastination and your brain are related, and the importance of creating a morning ritual – these are all important topics when it comes to overcoming procrastination; the section on how your brain relates to procrastination is especially important, because if you have a problem that affects the brain, like Attention Deficit Disorder, that could be related to why you’re having a hard time starting a project. I found a lot of information in this book to be interesting, however it does seem like this book is meant more for people who work from home 100% as independent contractors or freelancers, not someone like me, who works from home mostly as an employee and has to stick to a fixed schedule. I do, however, plan to try out some of these techniques for the independent contractor work that I do. I would also be interested to hear from anyone who works from home 100% as an independent contractor and tries (or has tried) the techniques in this book. If you’re interested in checking out this book for yourself, you can find it here. I have found that talking to yourself in a positive way can greatly influence how productive you are. I just wouldn’t reccomend doing it in public! Great article Erica! Yes, good article Erica. Always also looking for a good read as well. I will have to download the book as well. Good tips there. Procrastination has always plagued my and now that I’m trying to get my site off the ground there’s no room for it any more! Working from home should become a habit if you really want to success. Make sure to have a quite area for all your business hours and respect it. Also delegate your work, so you can be more productive.